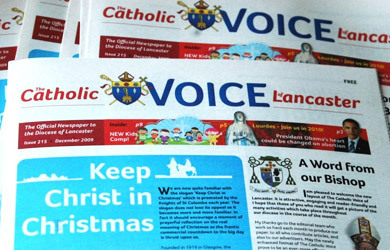 The Catholic Voice is the official newspaper of the Diocese of Lancaster and originally grew out of the need to provide information and a means of communication for the local Catholic community. The Catholic Voice of Lancaster is published by its owners; the Trustees of the Roman Catholic Diocese of Lancaster, a registered charity, (No. 234331), and is wholly independent of and separate from, any previous newspaper published by or on behalf of the diocese. Publication Date is the last Sunday of the month previous to publication date. If possible do please send articles for publication on CD or by email. Otherwise please type double spacing or write very clearly. Last date for copy is the last day of the month prior to publication. Photographs will be returned if you remember to put your name and address on the back of each and enclose suitable stamped and self-addressed packaging.